A Nasa robot is still missing and presumed dead on the surface of Mars. 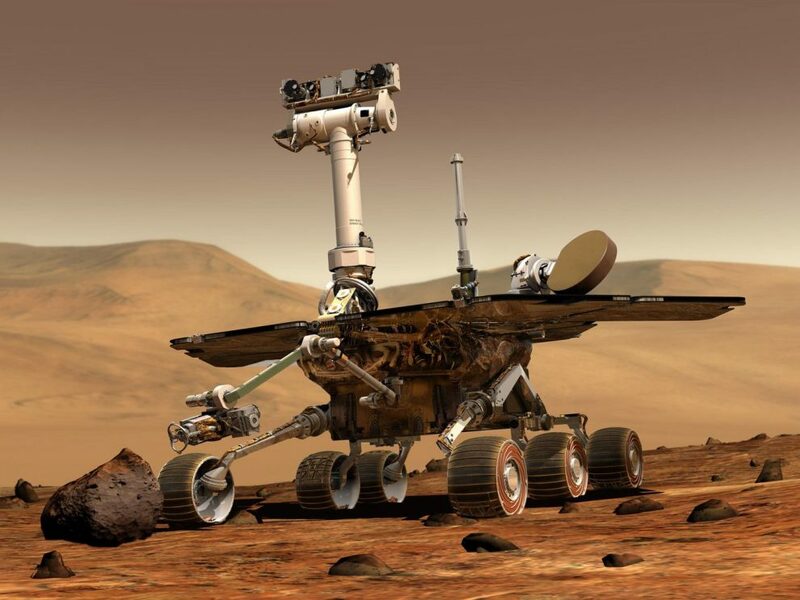 Space scientists lost contact with the Opportunity Rover almost two months ago as it was buffeted by a huge dust storm which covered the entire surface of Mars. The swirling maelstrom will have deposited powder onto the solar panels which power the exploration ‘droid, meaning it cannot recharge its battery to make contact with mission control back on Earth. New pictures taken by professional and amateur astronomers in recent days have shown the features of Mars emerge once again as the dust settles. But there’s still no sign of Opportunity and the mood at Nasa’s Jet Propulsion Laboratory is beginning to falter. Last week, forlorn stargazers even resorted to playing Wham’s ‘Wake Me Up Before You Go-Go’ before they started work each day to boost their flagging spirits. ‘Morale has been a little shaky,’ engineer Michael Staab told Space.com. ‘This is the first time she [Opportunity] has stopped talking to us and not resumed communication when we expected. On July 26, Nasa said the storm was subsiding but said it could take weeks or months before Opportunity can ‘recharge its batteries and phone home’. Nasa wrote: ‘Scientists observing the global [dust storm] – which is actually caused by a series of local and regional storms throwing dust into the Martian atmosphere – say that, as of Monday, July 23, more dust is falling out than is being raised into the planet’s thin air. That means the event has reached its decay phase, when dust-raising occurs in ever smaller areas, while others stop raising dust altogether. ‘Surface features in many areas are beginning to re-appear as seen from orbit. This should even be apparent through telescopes on the ground: Next week, Mars will make its closest approach to Earth since 2003 — a particularly good time for observing the Red Planet. Meanwhile, in Gale Crater, the nuclear-powered Mars Science Laboratory/Curiosity rover has noted a decline in dust overhead. The super-tough rover was only designed to survive for 90 days on the surface of Mars but has kept on trundling for 15 years. The storm which engulfed it was one of the largest ever observed on the Red Planet and blanketed the entire planet, throwing some regions into perpetual darkness. The challenge for Opportunity is surviving freezing temperates without the light of the sun, which warms up the Martian surface as well as providing the robot with the energy it needs to operate. There is still a chance it will come back to life when the dust drops from its solar panels. But this possibility will become less and less likely as more times passes.